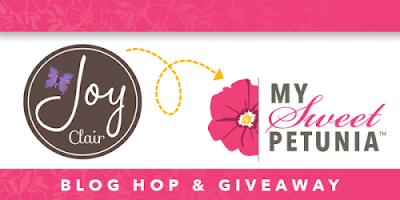 Kia here with you today to share my card done for the March Collaboration between My Sweet Petunia and Joy Clair Stamps. I decided to use the beautiful Mardi Gras stamp set for this card, but I wanted to use if for something other than what it was intended for. A very good friend works part-time for The Queen Elizabeth Theatre in Vancouver B.C. and this set has me thinking about her and how her eyes light up when she smiles or laughs, so that is where I went. 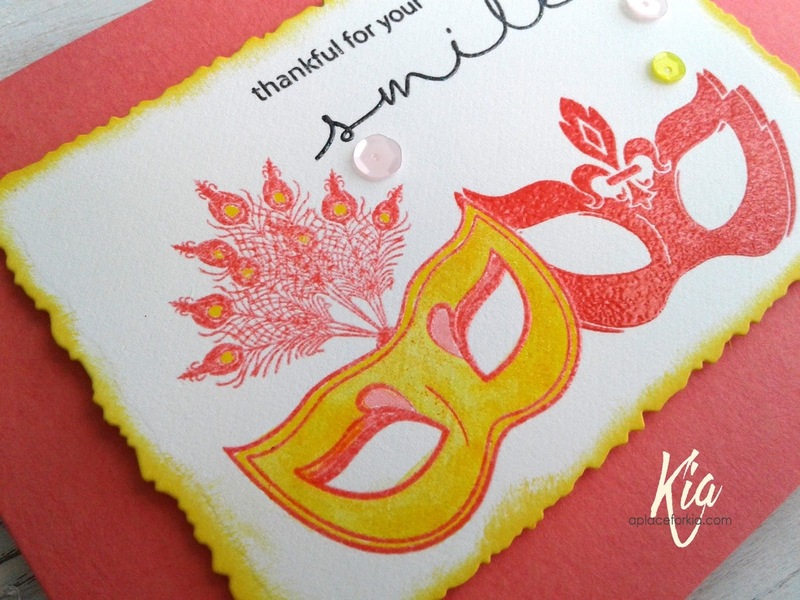 In my Mini Misti, using Neenah cardstock, I set up the stamps where I wanted them, then stamped the left mask using Melon ink. I then made a mask of just the right side of the stamped left image and stamped the second mask again using the melon ink, making several passes to darken the ink colour. The left mask is an open stamp, and the right mask is a full stamp image, as you can see below, so I sponged on some duckling (yellow) ink using a little make-up brushes. I did have pictures of the process, but they mysteriously disappeared from my phone! I added the yellow to the feathers using Zig brushes. Once I was finished with all the colouring, I stamped the images again with clear embossing ink and heat set using clear embossing powder. And, as this is about my friend's smiles, I stamped the sentiment using another Joy Clair Stamp called Hugs and Smiles using Ranger Archival Jet Black ink. I then stamped again with embossing ink and heat embossed with clear embossing powder. I wanted to add more yellow to the card, so I sponged around the edges of the deckled die using the Duckling yellow ink, then added fun foam to the back of the panel and attached it to a my Coral cardstock base, finishing with a few sequins. I hope you have enjoyed this card today. Thank you for visiting My Sweet Petunia. What a lovely card and stamp set! Beautiful color combo. Beautiful colours on this card! I'm Italian and I love Carnival. This make me thinking of the amazing Venice's Carnival Masks. 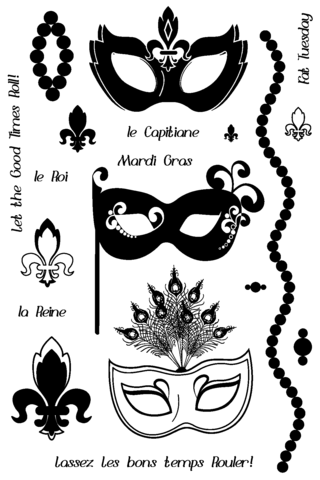 I hadn't noticed this pretty Mardi Gras set before! Lovely card! I have a daughter that studied theater so the first thing I thought when I saw your card was -Theater! 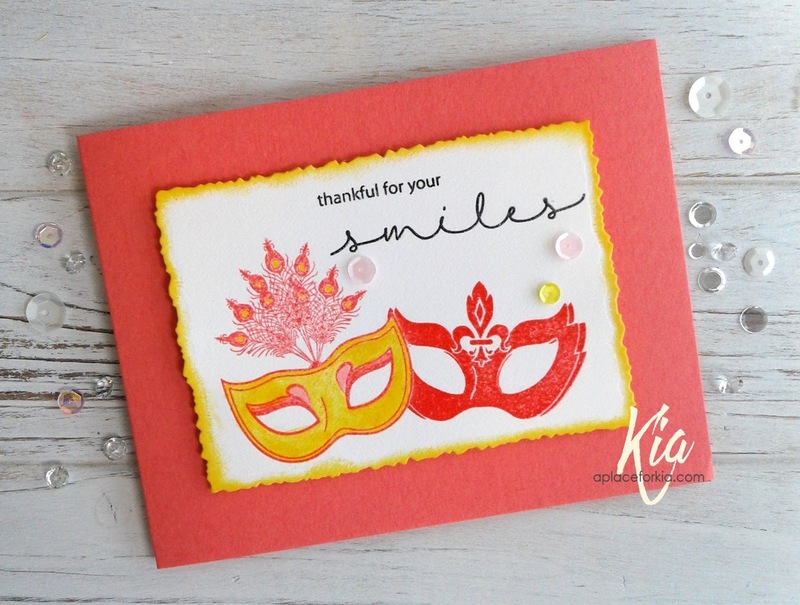 I love the coral color of your card and the yellow adds such a brightness! A very thoughtful sentiment to send to your friend. I'm sure she will love it! Kia, your carc is festive! Pretty colors! WOW Kia, this is so cool! I love how you used the masks and the colours you used for all of the images are great. ♥ it! Cute design and I like the cheery colors. Very pretty card! A neat stamp set! I love how you used the sweet Mardi Gras stamp set and made it match your sweet friend to make this beautiful card!! Could use this design with an endless array of colors as well!! Splendid idea and pretty with the frayed paper edges! Also easy to do to make the repeat inking with your sweet mini misti!! Wow ! That’s a fantastic, very original card ! The stamp set is gorgeous ! A lovely card using this really fun set! Love the mask with the feathers, so pretty.